Airlines go to great effort to get you the best view short of a U2 sortie or stay on the ISS. Don’t let the opportunity go to waste! Air travel for many professionals has become boringly routine. Hopping on a jet aircraft and flying across the country at 400+ knots loses novelty if it is repeated on a regular basis. However, air travel is still a fantastic opportunity for the curious geographer to engage their topic and even produce new useful media. 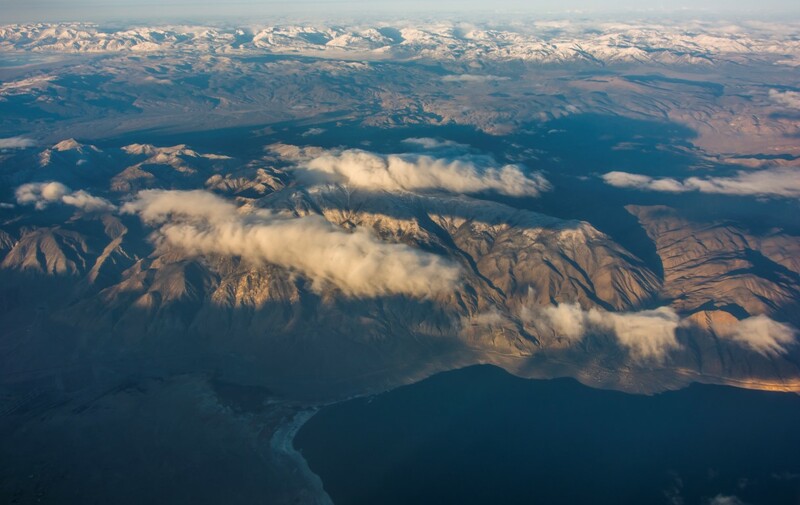 The view of the earth from typical flight levels is truly amazing, and with a little planning and some luck, you can make sure you are in the right place to get some nice photos of your favorite landscape features. Nobody takes more advantage of this than my friend Kelly Redmond, the regional climatologist at the Western Regional Climate Center. 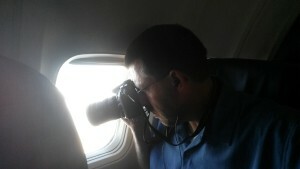 Kelly uses apps like FlightAware to evaluate typical flight paths for upcoming trips on his rather compressed travel itinerary, and books the flights and seating positions that will take him past the landscapes that he wishes to photograph at the correct light angle. Sometimes these are seasonally-dependent, such as snow cover on different mountain ranges or reservoir levels. Kelly picks his window seat on the aircraft to avoid the wing, and also chooses the side of the aircraft away from the sun to prevent problems with window flares and reflections. In every single presentation that I’ve seen Kelly give, he includes some interesting photo from a recent flight. These types of in-person images help illustrate a familiarity with the subject that is crucial for large/diverse audiences. The FlightAware website is an amazing planning resource for the photographer who can’t afford to charter their own bizjet. Here is how my last trip turned out, I made sure and got the early morning flight to maximize best light angle. My annotations on the screenshot show the primary photos I was after and ultimately obtained. I’ve started following Kelly’s example, although I don’t fly nearly as much as he does. My last trip to Las Vegas from Reno worked out exactly as planned – I got the early flight, found a window seat in the rear of the aircraft on the starboard side, and took several photos of one of my study areas in the morning sun. Aerial photo of Mono Lake on April 8th, 2015 taken from SWA Flight 917. A significant amount of curve correction, contrast adjustment, sharpening, and noise reduction was required using Adobe CameraRAW to filter out atmospheric haze and light scattering effects. Taking decent photos from an airline seat is not easy – you have to set a high shutter speed (1000/sec or better) to avoid camera shake, you will want a flexible zoom lens, and because of light scatter and other atmospheric phenomena you will want to shoot in RAW and edit later. Filters are not much help in combating haze it turns out; rather just rely on your developing process to get the contrast back. So, rather than book any old flight and sleep or play video games to prevent boredom, plan ahead and practice your aerial photography skills. Aerial photo of the essentials of the entire Walker Basin watershed. Walker Lake, the Wassuk Range, the interior valleys, and the headwaters in the Sierra are all visible in this one photo. Great post, I have pictures of the Arazona Meteor Crater, many locations over the Sierra Nevada and man made features such as pit mines, and statiums. One flight I must have been over a nuclear test area in New Mexico but didn’t have a camera. I couldn’t imagine what else could have caused so many circular craters scattering the landscape.